Saliva is one of a handful of “modern” bands that I follow. I wouldn’t say they are an all-time favorite but I do like them and I’ve been listening to them since the release of Every Six Seconds. I think they’ve done a great job writing singles throughout their career but it was the last two releases with former singer Josey Scott where I felt the band was finally getting more consistent in terms of writing a full album’s worth of quality material. When factoring in Scott’s departure and low sales for the last few albums, I figured it was going to a wrap for the band. Fortunately, that’s not the case as the band found a new vocalist and continued on. 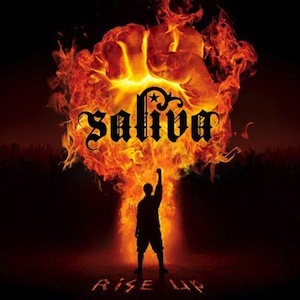 Rise Up is technically Saliva’s second release with Bobby Amaru. In an odd move, an album called In It to Win It was given a temporary release in September 2013 but with the impending release of Rise Up, the album was eventually taken out of print and pulled from iTunes. Very strange because all of the songs on Rise Up were on In It to Win It and this album actually features three less tracks than In It to Win It had. So it’s not like the band went back into the studio to write and record new songs. It’s the same songs. The only change is they’ve shuffled the track list. That marketing misstep aside, Rise Up is a worthy follow-up to Under Your Skin even if it the highlights here aren’t on pair with the highlights from that album. The songs still sound like Saliva (though they’ve completely dropped all rap-metal posturing) so anyone who has enjoyed the band in the past should like these songs. The only different is the vocals. Bobby Amaru is a good vocalist but fits much more in line with the generic modern alternative post-grunge whatever vocalist. Josey Scott stood out a bit due to his southern rock-style voice. “Rise Up” is done in the typical Saliva anthemic style while “Lost” and “Closer” are exactly the type of ballads you expect from Saliva. Rise Up sees the band staying the course despite replacing singers and it’s worth at least one or two spins from anyone who likes Saliva. With the band seemingly topping themselves with each new release, when I found out a new Saliva album was underway, I took notice. Cinco Diablo was easily the best of the band’s catalog so I was pretty interested in hearing this one. I first got into the band when most people did — with Every Six Seconds. Though I don’t think the band has ever delivered a knockout album, everything they *have* released has at least qualified as good. I was kind of disappointed when I read some statements from Josey Scott where he talked about going back to the rap metal that the band originally was so fond of. Sure, it was fine for the time but it just seemed like an unnecessary step back as I don’t think the nostalgia factor has kicked in yet for that subgenre. Hopefully it never will and luckily this album isn’t really to relive 1999 or 2001. “Badass” and “Burn It Up” are really the only two songs that retread Saliva’s earlier sound and they are fine for what they are. They sound like Saliva. As much as I liked Cinco Diablo, I like Under My Skin that much more. This is the band’s finest moment. For my money, the band has turned in their best effort yet. 10 songs and very little filler here. Whether it’s the bravado chest-thumping “Badass”, rock radio ready songs like “Nothing”, “Better Days” & “Spotlight” or the ballads “Never Should’ve Let You Go” & “Turn The Lights On” (Saliva has always done very well with their ballads), the album has stuck me and I can’t get it out of my head. “Toxic Suicide” is another favorite of mine, it has a slightly darker edge to it than the rest of the songs. I bought this album to the day it came out and I must have listened to it nearly 10 times all the way through in that short amount of time. Some albums I listen to and even though I enjoy them I’m ready to move on to the next album but Under My Skin has stayed in my player for the majority of the week. I’m not getting tired of it and there’s no reason this album should not be a big hit. Well, other than the fact that the music industry has screwed itself to oblivion. So far, “Badass” and “Nothing” have been released as singles. I’m surprised neither has charted but I definitely think “Better Days”, “Turn The Lights On” and/or “Never Should’ve Let You Go” all deserve to get released to radio as well. Really, most of this album is radio ready though. The hooks, catchy choruses and melodies are all over the place. Anyone who likes Saliva will like this album as well, I think. I guess Saliva is one of the more mainstream sounding rock bands that I listen to but they are so much more catchier than most of what makes it onto radio so that’s why I keep coming back for more. Highly recommended, strong contender to make my Top 10 list for 2011. To celebrate their 6th major release “Under Your Skin” Memphis rockers want to feature their fans in the OFFICIAL Digital Tattoo Poster. Pre Order Saliva’s Under Your Skin today to guarantee your spot on the poster. Upload an image of one of YOUR favorite tattoos. Your tattoo will be featured in an official Saliva collage poster. All posters will be available for download after street date! “NOTHING” FIRST NEW SINGLE UP FOR SALE AT ALL DIGITAL RETAILERS NOW! Moving into their 15th year together in 2011, multi-platinum band Saliva stays in touch with their heavyweight Memphis roots on their brand new 6th album, UNDER YOUR SKIN, arriving in stores on March 22nd. “Nothing,” the enigmatically titled first single pick, is available for sale at all digital retailers now (iTunes: http://idj.to/hOOhxR and Amazon: http://idj.to/hIn5Ox). The new album is Saliva’s first with two-time Grammy nominated alt-rock producer Howard Benson, known for his work with My Chemical Romance, Theory of a Deadman, Daughtry, Three Days Grace, All American Rejects, Papa Roach, Saosin, Creed, The Used, and others. 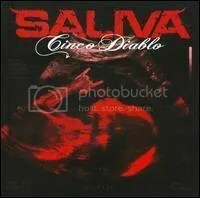 UNDER YOUR SKIN is the long-awaited follow-up to Cinco Diablo, the most recent studio album by Saliva, released December 2008, featuring the Top 20 Mainstream Rock singles “Family Reunion” and “How Could You.” In the interim, Saliva released their first compilation in March 2010, Moving Forward In Reverse: Greatest Hits. The career-spanning album included one new track, “Time to Shine,” which served as the official theme song of the 2010 edition of the WWE’s Extreme Rules all-star wrestling pay-per-view event. Saliva is singer and lyricist Josey Scott, guitarist Wayne Swinny, bassist Dave Novotny, and drummer Paul Crosby. The band was formed in Memphis in 1996, and issued their eponymously titled indie debut the next year. Their major label debut arrived on Island’s Uptown/Universal imprint in 2001, Every Six Seconds. The RIAA double-platinum album included their first charted rock single “Click Click Boom” and the Grammy-nominated #3 Mainstream Rock track, “Your Disease” (featured on the Dracula 2000 movie soundtrack). The RIAA gold Back Into Your System followed in 2002, containing the #1 Modern Rock track “Always” and its follow-up, “Rest In Pieces,” the first Saliva single to crack theBillboard Hot 100. Survival Of The Sickest was released in 2004. Its title tune single (#1 most added at Modern Rock, Rock and Active Rock) was the official theme song of Unforgivenin September 2006, another mega-successful WWE pay-per-view event. 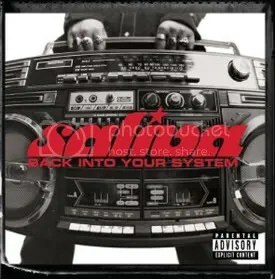 Back Into Your System is the band’s follow-up to their multi-platinum major label debut Every Six Seconds. It’s a definite step in the right direction as the band sheds a bit of their nu metal/rap-metal skin (not totally though) and decides to employ a more straight forward hard rock sound. There were a few songs I liked from their debut, but overall, it was a mixed bag because it was as if the band couldn’t decide if they were rap-metal act or southern rock act. I briefly dabbled in rap-metal, but decided it wasn’t for me, so I initially had zero interest in hearing what Saliva had to offer in 2002. I can remember it like it was yesterday though… my alarm went off one morning and the radio was playing I song I easily deduced was called “Rest In Pieces” and it stuck in my head all day, so as soon as I got home, I hit the internet and was surprised to discover it was Saliva. “Rest In Pieces” has become my favorite Saliva song and I was amazed they can up with such as catchy tune, but then I found out that Nikki Sixx & Sixx:AM lead singer James Michael wrote it. No wonder it was so good! Nikki Sixx still writes great radio ready hard rock songs. Unfortunately, the single didn’t chart very high but on the success of the lead single “Always”, the album went Gold. All told, this is a solid effort (though there is room for improvement) that sees the band moving past their nu-metal beginnings and turning into a good hard rock band. Lowlights: “Superstar II”. I generally think it’s a bad idea to do such a direct sequel to one of your previous songs in terms of title and sound (theme is okay), but not only did the band manage to copy the original “Superstar”, they also ripped off another song of theirs — “Click Click Boom”! A two’fer! Well, Saliva finally did it. After 7 years of delivering decent singles, but no albums to back them up, Saliva puts out their best effort yet. Funny thing is, this album has been a complete bomb, not even breaking the Billboard Top 100 in the first week of release. Ouch. And to think, their last album (release in 2007) debuted at #20. The public can be so fickle. The band branches out a bit on this album, if only by trying to sound similar to other bands (and themselves): “Forever and a Day” is a modern day power ballad, “So Long” reminds me a lot of Coldplay’s “Clocks” and “Judgment Day” kicks off sounding like their very own “Ladies and Gentlemen” and “I’m Coming Back” reminds me a of mix of P.O.D. and Breaking Benjamin. “Southern Girls” is my favorite song off this album, it’s a great southern rock tune and should be played in strip clubs all across the South. “Hunt You Down” is obviously a WWE-intended song. The band has licensed so many of their songs to World Wrestling Entertainment over the years, reading the lyrics of this song it seems obvious they just went ahead and wrote something specifically for them. I wouldn’t be surprised to hear this as the theme song to one of their many pay-per-views. Maybe it was lowered expectations, or even the lowered price (I bought it at one of the closing Circuit City stores) that has allowed me to appreciate this album, but nah…. It’s a really strong release and much like Hinder’s Take It to the Limit this probably would have been a Top 10 release for me had I actually heard it in 2008. I think Saliva has won my respect once again. Saliva, I find, is like a lot of new (nu?) metal/hard rock bands… More filler than killer. This isn’t the only Saliva album I own and while I think the singles they release range from decent to good, I’ve always been disappointed after buying one of their albums. Every Six Seconds is easily their worst outing though. They burst onto the scene in the middle of the nu metal & rap metal craze and fit right in. And that’s NOT a compliment. But… I will say they were a bit more melodic and old school hard rock than most bands of that time were. That would be a side of the band that would be further explored in future outings. Conveniently, they did that just as the rap metal scene was fizzling out.